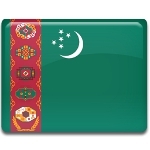 January 12 is Memorial Day in Turkmenistan. This date is sorrowful and special for Turkmenistan because it honors those who fell on January 12, 1881, defending the Geok Tepe fortress. Russian troops attacked the Geok Tepe fortress in December 1880. 25,000 defenders were holding the siege for 23 days but finally the city was taken by storm. Although the Turkmens had to fight only 6,000 Russians, they couldn’t hold resistance. Russian troops came into the city having dug a tunnel underneath the wall of the fortress. January 12, 1881, became the turning point in the battle. Russians detonated the mine under Geok Tepe. Once it was breached, the enemy troops were able to storm in the city. Initial explosion killed several hundred defenders, many more were killed during the fight. Defenders with about 40,000 civilians fled across the desert, being pursued by cavalry. 6,500 Turkmen soldiers were killed in the fortress and about 8,000 fell during the fight. Russians lost only 398 while 669 were wounded. January 12 was declared as a memorial day only in 1990 by Saparmurat Niyazov, the leader of the country from 1985 till 2006.